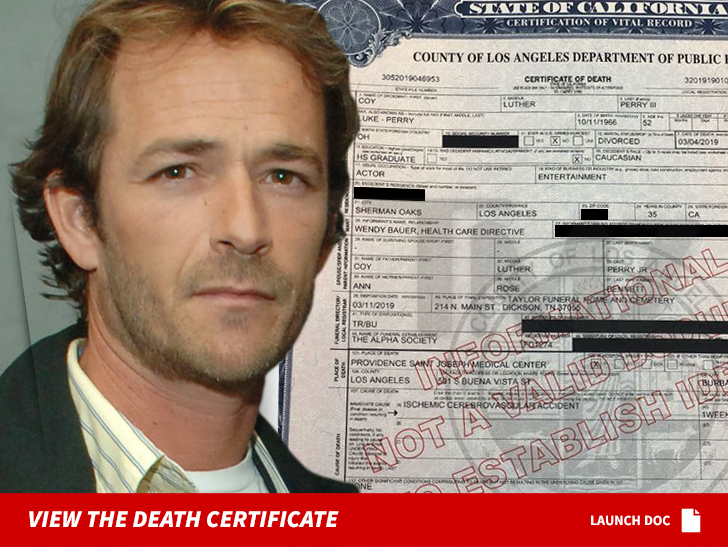 Luke Perry‘s death certificate confirms what we already know — he died as a result of a massive stroke — and it also reveals his final resting place is in Tennessee. The document was released Wednesday and it lists the cause of death as an “ischemic cerebrovascular accident” — a stroke — that occurred 5 days before his death at 12:44 PM on Monday, March 4. According to the certificate, obtained by TMZ, Luke’s fiancee, Wendy Bauer, is listed as his next of kin, or “informant.” It also says Luke’s body was transported to Dickson, Tennessee and he was buried there on Monday, March 11. Luke was a part-time resident of Tennessee, and had owned a farm there since 1995. TMZ broke the story — Luke died in Burbank at St. Joseph’s Hospital, where he’d been since suffering the massive stroke. As we first reported … paramedics rushed to Luke’s home in Sherman Oaks on Feb. 27 after he suffered the stroke. He was responsive and talking when EMTs arrived, but his condition deteriorated. Doctors sedated Luke in hopes his body could recover — but the damage was too extensive and his family made the decision to remove him from life support.